Chances are you have a friend that is always wrapped in a heavy blanket, or wears super cute cardigans year-round because they are always cold. If you don't know a friend like that, then you are probably that friend! I'm totally this person! You can find me at home in the middle of a Kansas summer with a blanket while I'm relaxing. If I'm at work, you can bet I will have a cardigan or jacket on, because office politics state that the temperature must remain freezing cold all year. If you have someone like this on your shopping list, here is the perfect gift guide for you! Cute Slouchy Hat // If you have to tolerate cold outdoor temps, you might as well have a super cute hat to keep you warm! Extra Warm Fuzzy Socks // These are my go-to socks in the winter! There is nothing worse than cold toes! Beaches Coffee Table Book // Treat your friend to the gift of dreaming of warmer weather with a beautiful collection of beach photos by Gray Malin. Heated Throw Blanket // A super fuzzy, cozy blanket is a great gift. A super fuzzy, cozy, heated blanket, is an awesome gift!! Assorted Teas // Not being a coffee drinker, a fun mix of assorted teas to warm my mug would be a great idea! Insulated Travel Mug // And, if your friend is always toting a warm drink around, a new insulated mug is a perfect gift! Keurig Mini // This little mini Keurig is not just for coffee lovers; it's perfect for hot drinks of all kinds. Plaid Blanket Scarf // I just can't resist a good scarf, and the colors in this one make it a great accessory all year long! Chunky Knitted Blanket // It's a fact that you can never have too many throw blankets! This one is a fun color and has amazing chunky texture. Looking for even more gift ideas? 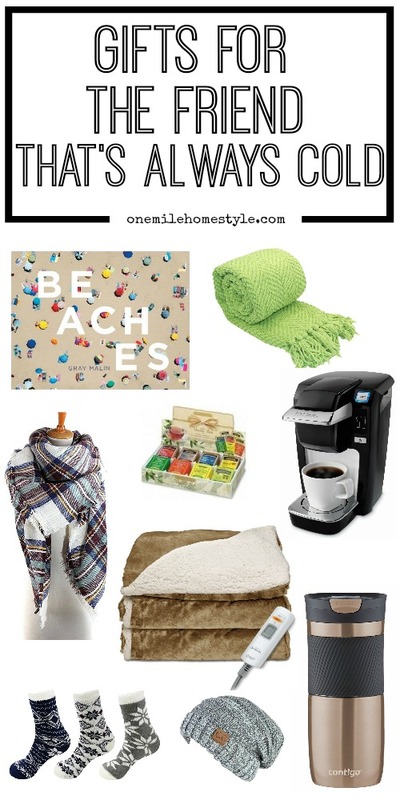 Check out my Gift Guides Page!